If you agitate cream enough, you will make whipped cream. Continue agitating it and skim off the liquid, and you will make butter. Put that in your coffee, and you have now wasted a lot of energy to put cream into your coffee. Somehow, the company trying to capitalize on this time waste of a beverage has amassed a following with its cherry-picked science and bold weight loss claims. Today, Bulletproof Coffee’s CEO Dave Asprey announced that his company would be selling a cold brew version of its bottled time waste at the home of packaged wasted times, Whole Foods, this month, reports Business Insider. I don’t care if you put butter in your coffee, because butter is great and coffee is great. But just know that you will not receive any magic benefits. You will have just consumed coffee and butter. The original bulletproof coffee recipe calls for the company’s proprietary coffee, butter, and medium chain triglyceride oil. You blend this, you drink this, and from my understanding your third eye opens, you no longer yearn for the earthly delights of food, and all your fat flies out. So, let’s go ahead and check some of those claims again. Those proprietary beans, as we’ve summarized in the past, have supposedly been stripped of “mycotoxins,” chemicals produced by fungus that the coffee industry already knows about. The Bulletproof website cites studies that say there’s mold on coffee, then extrapolates that to say there’s mycotoxins, then extrapolates that to say that one specific mycotoxin is bad because “it hits your kidneys, causes cancer, and messes up your immune system. Trust me, I know.” If someone trying to sell you a product ever says “Trust me, I know,” do not trust them. Mycotoxins will not be the death of you. One 1980 paper simply stopped studying mycotoxins since coffee is already roasted (killing mostly anything microbial) and any remaining toxins are at levels far below what’s worth worrying about. Another study of Spanish individuals found mycotoxin consumption far below the tolerable daily intake. In sum, no, you do not need to worry about mold shitting in your coffee. Let’s move on. Then there’s MCT oil, which Bulletproof claims will help you think better and lose weight. Medium chain triglycerides are fat molecules with three chains like the end of a pitchfork, each one a straight line. They are saturated fats and play a major role in why people think coconut oil is good for you. Coconut oil is not especially good for you. Bulletproof coffee says their MCT oil is better than coconut oil, because it specifically uses caprylic and capric acid, shorter prongs than the lauric acid found in coconut oil. A quick search for papers on PubMed reveals a dearth of evidence of positive benefits in humans of these specific oils, versus medium chain triglycerides in general. Even research into MCT and weight loss is fairly preliminary. And those studies that do investigate MCTs and cognition happened specifically in patients with Alzheimer’s, and hypoglycemic patients with Type 1 Diabetes—they did not test MCTs on normal, healthy patients. Breaking: sounds like someone is trying to sell you a product. We’ve debunked some of the other Bulletproof coffee claims before. They say that you can “program your body to burn fat,” but we’ve already written extensively about the fact that you can’t jumpstart your metabolism (aside for a slight effect from caffeine, butter or not). They say you can lose “a pound a day,” but if you’re cutting out a meal a day, of course you’ll lose weight. They say it “suppresses hunger;” that claim is plausible but preliminary. And sure, high-fat diets are the ones gaining momentum right now, but you can change your diet without buying a souvenir from some businessman’s trip to Tibet. You can’t jumpstart your metabolism. Losing weight is hard and requires real lifestyle changes. 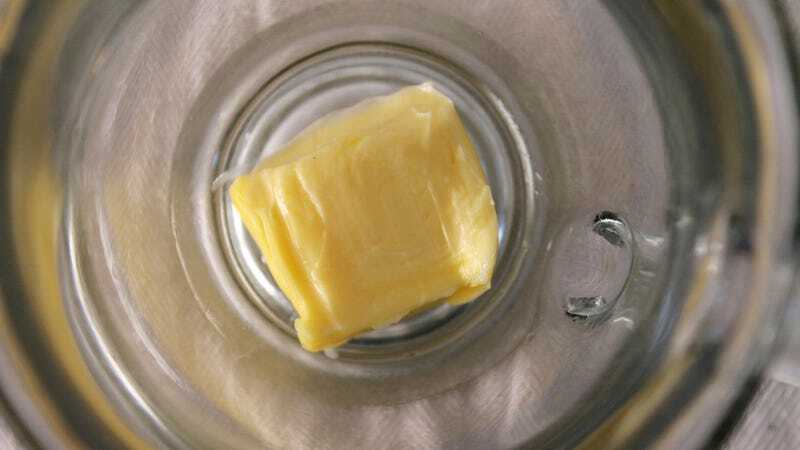 Butter in your coffee might taste good, but that’s all it is. Do what you want but don’t feel like you have to waste your money on someone else’s fever dream.